State-controlled Oschadbank (Kyiv) has launched the Apple Pay payment service, chairman of the financial institution Andriy Pyshny has reported. “Oschadbank the fastest in Europe several months ago integrated Google Pay. It has already launched Apple Pay. The future is in smartphones!” he wrote on his Facebook page. He said Apple Pay is based on security and confidentiality. “If you add a credit or debit card to Apple Pay, the card number itself is not stored in either the device or Apple servers. You are assigned a unique account number for the device, while it is encrypted and stored in a secure mode in the microchip “Secure Element” of your device. Each transaction is due to the generation of a unique one-time dynamic security code,” he said. According to Pyshny, to use the possibility of paying with an iPhone, it is not necessarily to have an Oschadbank card: just call the contact center of the bank and get an instant digital prepaid card. It can be connected to Apple Pay and they you can use the application. According to the press release of Oschadbank, one can pay with Apple Pay in stores using iPhone SE, iPhone 6 and newer models, and also with Apple Watch. The largest state-owned bank PrivatBank (Kyiv) launched the Apple Pay service on Thursday. “Apple Pay in Ukraine! Today PrivatBank launched this globally popular payment service,” Ukrainian Finance Minister Oleksandr Danyliuk wrote on his Facebook page. He said that this is the indicator of the attractiveness of the Ukrainian market for global innovative companies. PrivatBank said in a press release that a credit or debit card of the bank Visa or Mastercard should be connected via Privat24 or Wallet applications to use the new payment service. “One can use iPhone SE, iPhone 6 and later models of iPhone, as well as Apple Watch to pay in stores,” the bank said. PrivatBank Board Chairman Peter Krumphanzl later at a briefing said that the arrival of Apple Pay in Ukraine means in practice a breakthrough in the state cashless program. “This is a big step for Ukraine, on the one hand, from the point of view of innovation, and on the other hand, from the point of view of the state cashless program. This is a big step forward. I think this is very important for Ukraine,” he said. The head of the retail business at PrivatBank, Oleksiy Shaban, added that the arrival of one of the world’s leading mobile payment technologies to the Ukrainian market is becoming a decisive incentive for large and small businesses to actively switch to cashless technologies. 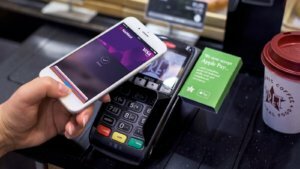 “We expect that for the first month of Apple Pay work in Ukraine a significant increase in the share of mobile payments by our customers will be seen,” he said. Shaban said that at present more than 2 million customers of the bank are users of the Privat24mobile application. 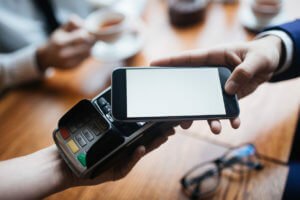 According to Country Manager of the representative office of Mastercard Europe in Ukraine Vira Platonova, the number of payments using a mobile phone in Ukraine in 2017 increased 14 times, and this resulted in the arrival of Apple Pay to the country. 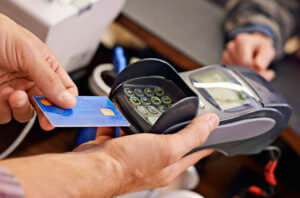 “Ukraine is a very developed market in terms of contactless payments. In the world in 2017, the number of payments with a mobile phone quadrupled, and in Ukraine it increased 14 times. It is therefore not surprising that Apple Pay came to Ukraine – one of the first countries in our region,” she said. Platonova said that Ukrainians often pay with the help of mobile devices in retail networks, in transport, in restaurants and at gas stations. “Payments using a mobile phone are absolutely safe, the level of fraud in these transactions is almost a nil,” she said. American Apple Inc. could launch the Apple Pay service of mobile payments in Ukraine in June 2018, co-founder of the Monobank project Oleh Gorohovsky has said. “PrivatBank starts first and then all the rest. According to my information, this may happen in June. There are some employees of PrivatBank whose iPhone test cards are already connected to Apple Pay,” he wrote on Facebook. According to Gorohovsky, Apple Pay will work in Monobank in a couple of months after the launch of the first bank. He also stressed that such are the features of launching Apple Pay in almost all countries. The co-founder noted that Monobank clients actively use the Google Pay application and Monobank is one of the three leading banks in Ukraine in this indicator. Earlier, the profile English-language portal AppleInsider reported, with reference to Apple Head Tim Cook, that U.S.-based Apple Inc. confirmed the launch of Apple Pay in Ukraine in the coming months. The Apple Pay service allows paying for purchases using an Apple smartphone, to which the bank card is attached.